There's a world interspersed with ours that the average citizen is unaware of. Meet the agents whose job it is to make sure things that go bump in the night remain in your imagination and do not materialize into the three-dimensional beings they actually are. Demon Ryder is the first book in the Galactic Agency Series. Available at Amazon, Barnes and Noble and Smashwords. 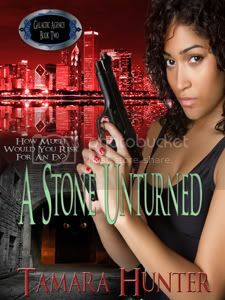 A Stone Unturned is the second book in the Galactic Agency series. Available now at Amazon. That’s the question Galactic agent Nia Stone must answer when she learns her former lover has been kidnapped by rogue demons. An extraction mission is intense on a good day. Toss in unresolved feelings and a rescue becomes dicey at best. Pushing her feelings aside, Nia heads to Demopolis, the demon city lying beneath the streets of Chicago. Using every bit of her skills, she ultimately proves successful in her assignment. Moloch Endemar, head of the American Demon Council, has always regretted ending his scorching hot relationship with Nia. Now, faced with an arranged marriage he does not desire, he is determined to discover a way to win to make Nia forgive him. But Moloch’s return to Nia’s life threatens not only her heart, but quite possibly the very existence of demons themselves.